"When I make an instrument, my intention is everything. If I know who I'm creating it for, they are in my head the entire time Im making the instrument." I have two work areas, one is always humidity controlled at 45 %. This is where all my wood is stored and I do all the joining of tops and backs, gluing the braces, gluing on tops and backs- anything where it is important to maintain a constant humidity. This humidity control is absolutely vital in the long term life and stability of a musical instrument. It is, in fact the industry standard and has long been adapted by every successful American maker. 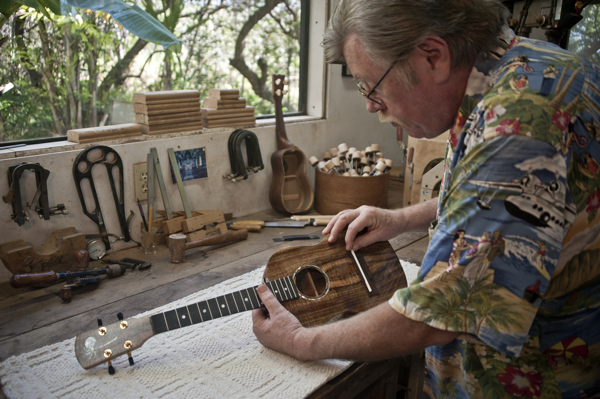 What this does is to insure that each `ukulele or guitar leaves my shop ready to face the world. As with any fine instrument, owners still must be sure to avoid extremes of temperature and humidity. In this room I store all my instrument wood- much of which I have had for over a decade. I will never make and instrument unless I personally know the wood has been cut and air dried for at least four years and has then been in my dry room for at least six months. There can be no shortcuts to long term stability. I fully expect, with reasonable care, my instruments to be playable 100 years from now. While we're on the subject of wood, let me talk about Koa. 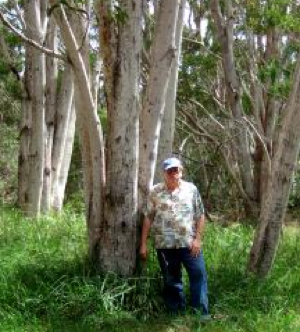 I make many of my instruments from this Native Hawaiian Hardwood. While this wood is a protected species, there is a problem on the Island with illegally harvested or poached trees. Absolutely all my Koa comes from legally licensed salvaged Koa from dying or downed trees. My second work area is larger, it is where I do my my sanding, much of it by hand, and where I have a few simple power tools- a small band saw and table saw, bench top drill press, joiner, and a belt and spindle sander. Those, besides a few routing tools for rosettes and making bridges and molds for bending and building instruments are pretty much it. Nothing very high tech. A corner of this room is where much of the finishing is done. Now for my internal process, which, for me, is harder to explain. First, each instrument is built individually, I do not make in batches. I don't feel that those makers who build that way are doing anything wrong, it is their process. How I feel about this was best explained by a friend of mine, a violin maker in Italy. I asked why he built one at a time and many of his friends built in small batches- it is obviously faster. He said “For me, the soul of the instrument becomes confused”. I believe that ideally, an instrument, in Hawaiian terms, caries the “mana” of the maker and, as it is played, also the mana of the player. When this happens, the `Ukulele or Guitar develops it's own mana or spritual energy, sort of an amalgam of maker, player and all the music that has been played on it. I have often said that “intent” is the most important part of the building process. What a builder is thinking will translate into what he is making. This assumes enough experience and knowledge that the basic physical motions aren't a problem. If an `ukulele maker thinks that all Mango `ukulele sound bad,(which they don't), but makes one anyway, guess how it will sound. When I build and set up any instrument, and I know who I am making it for, that person and the music they play is on my mind. If I am building something with no particular client in mind, I know what I want the completed `ukulele or guitar to sound like. This sounds simple, but is perhaps, not so common. Someone recently said that I build by “intuition”. I don't thinks so, and I hope not.Ideally, everything that goes into construction should have a reason. When I go to my bracewood selection, and pick out Engelmann Spruce instead of equally excellent Adirondack or Sitka, for a particular instrument, I may not consciously go through the reasons for my choice, but am guided by a lifetime of observation. I have had tens of thousands of various instruments in my hands, and I hope I have paid attention. What is your favorite instrument? I can honestly say, the next one I will build. It is always a challenge. I am always making small changes- what if the back is freer to resonate just a little more? Perhaps for this style playing, the soundhole should be 1/2” higher? I have never made any instrument that I think is perfect, if I ever think so, I will be wrong. But it is always something to aim for.